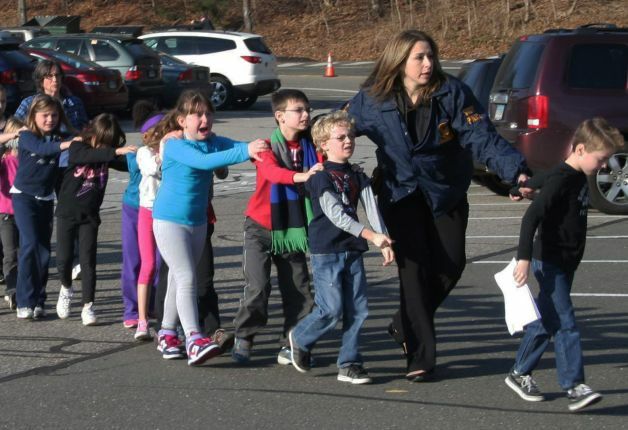 The iconic photo of children being escorted out of Sandy Hook Elementary, the location of a mass shooting late last year. I’ll admit that I’ve always had a strange fascination with Dateline. It’s one of those shows that I will totally forget about, and then, before I know it, I’m shamelessly pouring over an episode with my mom in our living room. While I might not engage in such habits at school, namely for the sake of remaining within the realm of social acceptability, I feel like every American has found themselves perhaps a little too invested in a crime show every now and again. In fact, it comes with little surprise that some of the longest running shows on television—CSI, Law & Order, NCIS—are violent in nature, and merely repackaged in a form that is a little more palatable for prime time. I’m not sure if the curiosity surrounding violence is an innately human characteristic, or if it just a product of our simply having come from America, the land of of the mass shooting. Whether or not we realize it, violence is integral to our culture, and has often held up necessary developments in our legal system. It isn’t very well established when excessive violence first emerged in our society. Perhaps it was with the systemic genocide of the Native American peoples, or even with the trials at Salem. Or maybe it was with the Boston Massacre, the mythologized shoot-out that served as a grim foreshadowing of the Revolution to come. Even though we might not be able to pinpoint its exact inception, violence, it seems, has always been integral to our national identity. Over the years, it has changed form: from war mongering nationalism in the Gilded Age, to the televised coverage of the Vietnam War. Nowadays, violence has a more viral nature, encapsulated by the aforementioned shows, and made accessible to children through various means, from video games to the adorably brutal Happy Tree Friends. I’m not going to preach about how video games are corrupting our children, because they will undoubtedly be corrupted long before getting into Call of Duty, but one must wonder what the implications of presenting a permissible outlet for aggression truly are. In some cases, however, we as a nation have made an effort to curtail violence with legislation and policy. On March 7, Congress accomplished what seemed to be an impossible task. In miraculously passing the Violence Against Women Act with bipartisan support, we have addressed the role of violence in the lives of women—as well as LGBTQ Americans—by providing aid to programs that bring justice to victims of assault and abuse. Though VAWA provides a legal framework for approaching instances of abuse and violence, its recent passage marks a nearly twenty-year fight for such legislation, showing that necessary changes often offer too little too late. At the center of this debate is, without a doubt, the Federal Assault Weapons Ban that quickly re-materialized in the wake of the Sandy Hook shooting on December 14. Although the law was initially passed by the Clinton administration in 1994, its second passage after expiring in 2004 is highly unlikely. In a well-publicized Washington snafu, Democratic Senate Majority leader Harry Reid bluntly told California Senator Diane Feinstein—one of the ban’s most vocal supporters—that a clause regarding assault weapons would not be included in the gun-regulations that will be brought to the Senate floor next month. Although the assault weapons clause was anything but a sure thing, failure to approach assault weapons at such a critical moment in American history is extremely disheartening. While the atrocities at Sandy Hook were quite unlike anything seen before, we as a nation have failed to respond to any of the other mass shootings in recent memory—Aurora, Virginia Tech, Columbine. Although the fact that Sandy Hook’s victims were by and large children, it is disturbing that we’ve had to wait for children to become targets before finally addressing the Bushmaster-toting elephant in the room. Because smaller-scale shootings never warrant publicity, we as a country have also failed to address the omnipotence of gun violence, which has taken the lives of 2,900 people and counting since mid-December. While people can certainly get on their constitutional high horse and denounce any measures towards curbing America’s gun obsession, it is important that we remain pragmatic. While the Second Amendment is an undeniable right, one must remember that automatic weapons have since changed the arms landscape. Even though the NRA does maintain that more guns are the answer, the recent shooting at the Marine Corps Base in Quantico, Virginia shows that access to weapons is not a panacea for gun-appropriated violence. Through and through, the United States seems to have established a national mindset that is more passive towards violence than we’d like to admit. While the nation’s response to incidents like the Sandy Hook shooting has been anything but quiet, the inability to pass an assault weapons policy indicates that our country might not be ready to reconcile its violent ways. Even though we have made steps to improve this social ill to some extent—namely, with the recent passage of the Violence Against Women Act—it seems as though the issue is not so much legal as it is cultural. Even with the alternate passage of state-based measures, there is no guarantee that violence will be curtailed. Instead, we should look to ourselves, and know that we are the true agents for change.